This is one of the oldest and most familiar of all royal ceremonies. Every other day, a throng of tourists gather outside Buckingham Palace to watch the exchange of duty between the Old Guard and the New Guard. 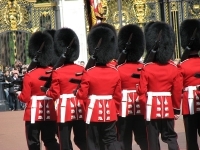 The Foot Guards wear their traditional uniforms, complete with bearskins, but carry modern weapons as their role is practical as well as ceremonial. A band from one of the five Foot Guard regiments accompanies the handover, playing anything from traditional military marches to pop tunes. Guard Mounting also takes place daily at the same time at Windsor Castle and the Tower of London. The Changing of the Queen's Life Guards involves the handover of duty between the two mounted regiments, the Blues and Royals, and the Life Guards. It is more flamboyant when the Queen is in residence (most weekdays), with the Captain of the Guard and trumpeter leading the procession. The Changing of the Guard at Buckingham Palace takes place daily at 11.30am between April and July, and on alternating days the rest of the year. It is always best to check the calendar for the exact times of the changing of the guard because adjustments are sometimes made to the schedule.